Volunteers at the Nearly New Sale held in February at Hugh Ripley Hall. 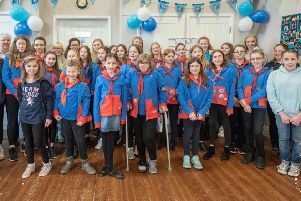 Organisers of this year’s Save the Children Nearly New Sale held at Hugh Ripley Hall in Ripon anticipate the total sum raised by the event will be around £9,000. The total amount is uncertain because some donated items have yet to be auctioned. Organisers also want to trace their 12ftx3ft banner which went missing from the B6265/A61 roundabout. Phone 01765 602832 with any information.